MItt Romney is taking a lot of heat for saying that he’s “not concerned about the very poor.” To be fair, he also said he’s not concerned about the very rich either. Lucky for him the feeling isn’t mutual that that side of the economic divide. According to recent FEC filings, the very rich are very concerned with Mitt Romney’s campaign for his party’s presidential nomination. And why shouldn’t they be concerned? After all, some of them are Mitt’s friends and former colleagues. One of Mitt Romney’s strongest assets as the GOP presidential front-runner is also a potentially serious liability in the race: his heavy reliance on a small group of millionaires and billionaires for financial support. A quarter of the money amassed by Romney’s campaign and an allied super PAC has come from just 41 people, each of whom has given more than $100,000, according to a Washington Post analysis of disclosure data. Nearly a dozen of the donors have contributed $1 million or more. Some of Romney’s biggest supporters include executives at Bain Capital, his former firm; bankers at Goldman Sachs; and a hedge fund mogul who made billions betting on the housing crash. These and other donor details follow the release last week of Romney’s tax returns, which showed millions held in the Cayman Islands and other overseas havens and a tax rate that is far lower than that paid by most American workers. In Romney’s case, it looks like the Citizens United ruling has had the effect of uniting the 1 percent behind one of their own, and their support for Romney’s primary campaign portends even greater investment a Romney victory in the general election, if betting on him in the primaries pays off. One of the ironies of the first post-Citizens-United is that the Republican primary race has given us our first glimpse of how the Supreme Court’s ruling might change not just our electoral process, but our democracy itself. “If you think about the way the president is beginning to frame the campaign, presenting this as a campaign of the 99 percent against the 1 percent, that in some ways is adding fuel to the fire to keep these donors involved,” he said. …In 2010, Senate Democrats twice came within one vote of passing a bill to require all groups engaging in political spending to reveal donors of $1,000 or more and to require top officers of outside groups, as well as their leading donors, to appear on camera in any television ads vouching their approval. But it’s not just Romney. Both Mitt Romney’s and Newt Gingrich’s campaigns are spawns of Citizens United. Both also hint at the underlying danger in the Supreme Court ruling that makes it easier for a very small number of very wealthy citizens to buy a controlling interest in our democracy — in an eye toward achieving very specific outcomes. Romney’s Super PAC paid for his Florida onslaught against Newt, and successfully bought him that victory. Want to know how Mitt Romney won Florida and why he’ll almost certainly be the GOP nominee? There’s an easy answer: a Super PAC and deep-pocketed donors. According to the latest disclosure reports, the pro-Romney Super PAC, Restore Our Future, raised $30 million in 2011, 98 percent from donors who gave $25,000 or more. The PAC got $10 million from ten donors who gave a million bucks each, including from Houston Republican Bob Perry, the major funder behind the vile Swift Boat Veterans for Truth in 2004. Newt relied on just one donor to buy his win in South Carolina. But when Sheldon Adelson shelled out $5 million for Newt’s South Carolina victory, it was just as much a return on an old favor as it was an investment in future favors. In its Citizens United decision, the Supreme Court upended our democratic elections by decreeing that corporations and über-wealthy individuals can dump unlimited sums of cash into campaigns to elect their favored candidates. Astonishingly, Justice Anthony Kennedy declared in his majority opinion that such a gusher of special-interest money would not “give rise to corruption or the appearance of corruption.” Who knew so much political naiveté could be cloaked in a single judicial robe? Justice Kennedy, meet Sheldon Adelson — a product of your cluelessness about how real politics work. For years, this casino baron has spent lavishly on right-wing front groups to advance his personal agenda, including pouring money into Newt Gingrich’s campaign. The billionaire and The Newt became symbiotic buddies in the mid-’90s, bonding over their shared fondness for crushing labor unions. Adelson was bitterly fighting Nevada unions, pushing a state law to crimp worker rights. Gingrich, then the House Speaker, endorsed Adelson’s Nevada legislation and also backed a tax break in Congress for casinos. In turn, Gingrich got campaign cash, funding to support him after being drummed out of office in disgrace in 1998, free rides on Adelson’s corporate jet, and backing for his present run for the presidency. In the past, the biggest personal check he could’ve taken from his casino sugar daddy was $5,000. After the Supreme’s Citizens United edict, however, Adelson can go all in to push his willing servant into the White House. Gingrich can thank the Supreme Court for making it possible for his contributions from Adelson to increase one thousand times over — from $5,000 to $5 million. Likewise, Romney can thank the Court for allowing him to get by with even more help from his friends than he would have been allowed before. The thing is, 1 percenters like Adelson and Romney’s buds from Bain don’t generally plunk down that kind of money without expecting something in return. Gamblers don’t make bets unless they expect to win something. 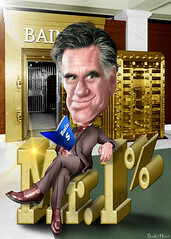 And backers like Romney’s Bain Capital colleagues don’t make investments without expecting something in return. You don’t have to be a Supreme Court justice to expect that the payoff comes if their candidate wins, and promotes policies that the investors favor or that favor the investors. So, what does the 1 percent want in return for its investment? What do the candidates have to promise them, explicitly or implicitly? How much policy does $1 million or $5 million buy? What does a controlling share in our democracy buy them? Sheldon Adelson’s interests seem to center on Middle East policy, but it’s likely Romney’s investors are looking for returns that his closer to home, closer to their bank accounts. …The revelations come at a time when President Obama and other Democrats are increasing their focus on economic fairness issues ahead of the 2012 elections, including calls to increase tax rates on millionaires and close tax loopholes on investment income. Sen. Al Franken (D-Minn.) said at a news conference Wednesday that hedge-fund managers are helping Romney because he opposes higher tax rates for a type of investment income, known as “carried interest,” that primarily benefits the wealthy. “Of course these guys are going to give a million dollars,” Franken said. “What a bargain — what a bargain to give that to a candidate who they know will veto a bill that makes the carried interest subject to the top” income tax rate. …Paul Begala, a longtime Democratic strategist who advises a pro-Obama group called Priorities USA, argues that Romney’s close connections to the super-rich exacerbate his problems relating to regular voters. Romney has generally fared poorly among lower-income voters in early GOP contests, particularly in his loss to Newt Gingrich in South Carolina on Jan. 21. There’s another side of the coin. Citizens United has united the 1 percent behind the candidates of the one percent. (Republicans, of course, now want to allow billionaires and corporations to contribute directly to campaigns.) It’s also uniting the 99 percent. a Montana Supreme Court decision recently paved the way for a challenge to the Supreme Court’s Citizens United ruling, and across the country support is building for an amendments to essentially repeal the ruling, and to end corporate personhood. Like its name says, Citizens United has united citizens, alright — in battle that will determine the fate the nation. Democracy? Or Plutocracy? There’s still time to place your bets. Update: One of those secret donors isn’t so secret anymore. One of the mystery donors to the pro-Romney super PAC, contributing $250,000 in late July, was identified only as “Paumanok Partners LLC” in the most recent campaign finance reports, which were filed late Tuesday night. The report listed just a post office box for Paumanok in New Canaan, Conn. The man who appears to be behind the donation, or at least closely linked to it, is William Laverack Jr., chairman and chief executive officer of Laverack Capital Partners, a private investment firm. He is also identified as a senior adviser to Tiger Infrastructure, a private equity firm that invests in businesses in sectors like power, waste and transportation, founded by Julian Robertson and Emil W. Henry in 2009. Mr. Robertson donated $1 million to Restore Our Future in November. …The Times was able to trace the donation back to Mr. Laverack, essentially, through a nonworking Web site. Unable to find out anything about Paumanok, Matt Ericson, a graphics editor, decided to just plug in “Paumanok Partners” into a Web address, typing in paumanokpartners.com. That revealed a Web site that was under construction and did not show up in Google searches.